Peter Slavin and David Torchiana may have erred when they noted in their Summer 2007 letter that “fewer college graduates are choosing to study medicine.” In fact, the only limiting factor for bright young students is the number of places available in medical schools. My son recently applied to medical school. In one rejection letter, a school indicated it had received about 11,000 applications for 110 spots and would interview only 1,000 candidates. In addition, their letter laments the decrease in medical residents who chose careers in general internal medicine. That may not necessarily be bad. In this day of complex pharmacology and technology, perhaps patients will be best served by more specialists. An educated population may demand an à la carte approach to care, with a cardiologist handling their hypertension and an endocrinologist their diabetes, rather than relying on generalists. Although it is true that the number of medical school applications has risen in the past four years, that fact is merely a blip in a broader, opposing trend: During the past 30 years, the U.S. population has increased by 40%, yet the number of medical school slots has remained relatively level. During the past decade, the number of applicants per slot has dropped from three to two. We found it ironic and a bit disheartening that the Massachusetts General Hospital’s Stoeckle Center, named after John D. Stoeckle, a physician noted for one-on-one doctoring, is proposing a team approach to primary care (“Are We Running Out of Doctors?” Summer 2007). Why not a team approach to friendship? To marriage? The essence of good medical care is the comfortable, trusting, long-term relationship between one patient and one physician. Our medical culture must be structured so that our best young men and women will once again recognize and seek the rewards of such work. 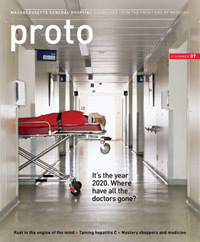 In the Summer 2007 issue of Proto‚ flanked by Drs. Slavin and Torchiana’s letter calling for incentives to promote primary care and the story “Are We Running Out of Doctors?” is an interview with Max Aguilera-Hellweg, who started medical school late in life and, upon completion of his training, decided to return to his previous profession as a photographer (“Picturing the Other Side”). Each to his own. But the nation’s medical schools must realize that for every student they admit who does not practice or do research, or who is admitted at an older age, or whose other responsibilities in life mean that he or she will not practice full time, there are multiple patients who will not be able to find a doctor. Russell L.R. Ryan // General Surgeon, North Shore Medical Center, Salem, Mass.